Is it possible to remove duplicated rows in Notepad++, leaving only a single occurrence of a line? Notepad++ can do this, provided you wanted to sort by line, and remove the duplicate lines at the same time. The check boxes and buttons required will now appear in the menu under: TextFX -> TextFX Tools. Make sure "sort outputs only unique..." is checked. Next, select a block of text (Ctrl+A to select the entire document). 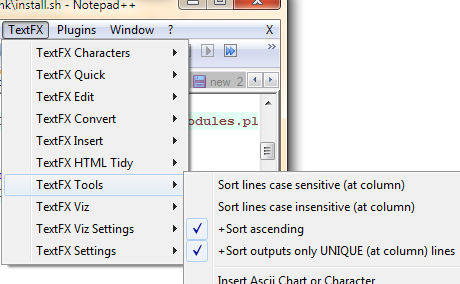 Finally, click "sort lines case sensitive" or "sort lines case insensitive"
and replace with nothing. This leaves from all duplicate rows the last occurrence in the file. No sorting is needed for that and the duplicate rows can be anywhere in the file! ^ matches the start of the line. $ matches the end of the line. \s+?^ this part matches all whitespace characters (newlines!) till the start of the next row ==> This removes the newlines after the matchd row, so that no empty row is there after the replacement. (?=. *^\1$) this is a positive lookahead assertion. This is the important part in this regex, a row is only matched (and removed), when there is exactly the same row following somewhere else in the file. Then open the file again in Notepad++. The latter versions of Notepad++ do not apparently include the TextFX plugin at all. In order to use the plugin for sorting/eliminating duplicates, the plugin must be either downloaded and installed (more involved) or added using the plugin manager. A) Easy way (as described here). B) More involved way, if another version is needed or the easy way does not work. After installing the TextFX plugin, follow the instructions in Answer #1 to sort and remove duplicates. Also, consider setting up a keyboard shortcut using Settings > Shorcut mapper if you use this command frequently or want to replicate a keyboard shortcut, such as F9 in TextPad for sorting. You may need a plugin to do this. You can try the command line cc.ddl(delete duplicate lines) of ConyEdit. It is a cross-editor plugin for the text editors, including Notepad++. enter the command line cc.ddl at the end of the text. copy the text and the command line. paste, then you will see what you want. 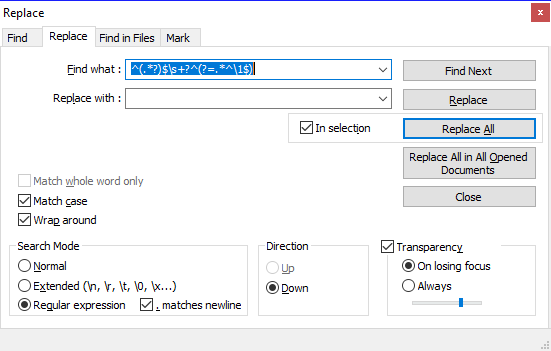 Hit Replace Button Until there is no more Matches for the Regular Expression in your file. Plugin manager is currently unavailable(does not come with the distribution) for Notepad++ , you must install it manually ( https://github.com/bruderstein/nppPluginManager/releases ) and even if you do, a lot of the plugins are not available anymore (no TextFX) plugin. Maybe there is another plugin which contains the required functionality. Other than that the only way to do it in NotePad++ is to use some special regex for matching and then replacing (CTRL+F -> Replace tab). Although there are many functionalities available via Edit menu item (trimming, removing empty lines, sorting, converting EOL) there is no "unique" operation available. I you have Windows 10 then you can enable Bash (just type Ubuntu in Microsoft Store and follow the instructions in the Description to install it) and use cat your_file.txt | sort | uniq > your_file_edited.txt. Of course you must be in the same working directory as "your_file.txt" or refer to it via it's path. how to remove dublicate proxies in list? How can i remove duplicated lines (txt file)? Does Notepad++ show all hidden characters?